Johannesburg, 19th September 2012 – South African consumer confidence has maintained a positive year-on-year outlook according to the latest MasterCard Worldwide Index of Consumer Confidence, released today. The survey recorded an overall increase of two points in South African consumer confidence to a current score of 69.8 compared to 2011, when a score of 67.8 was recorded. Now in its eighth year in South Africa, the MasterCard Worldwide Index of Consumer Confidence is the Asia/Pacific, Middle East and Africa (APMEA) region’s most comprehensive consumer confidence survey. The Index is based on a survey which measures consumer confidence on prevailing expectations in the market for the next six months based on five economic indicators: Economy, Employment, Stock Market, Regular Income and Quality of Life. 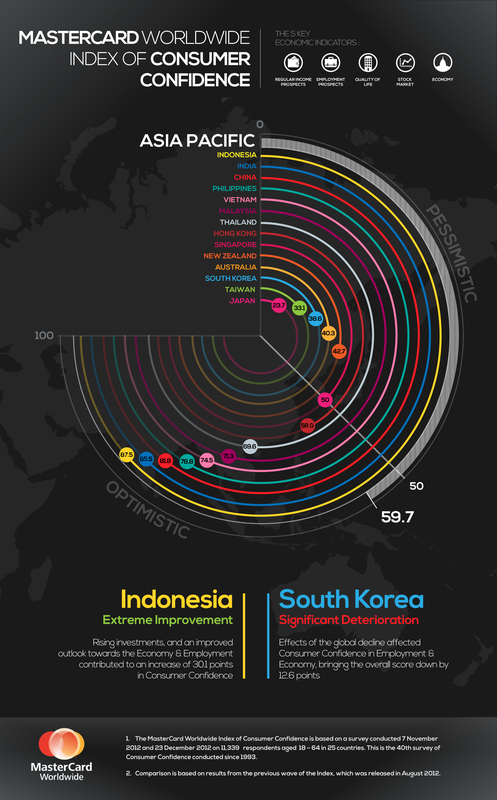 The Index score is calculated with zero as the most pessimistic, 100 as most optimistic and 50 as neutral. The most recent survey was conducted between 24th April 2012 and 10th June 2012, and involved 11,376 respondents aged 18 to 64 across 25 markets across the Asia Pacific, Middle East and Africa regions. On the African continent, the survey was conducted in Egypt, Kenya, Morocco, Nigeria and South Africa. The Index and its accompanying reports do not represent MasterCard financial performance. “The latest Index results show an overall year-on-year increase in optimism with all five of the key indicators that make up the consumer confidence score recording increases. This indicates that South Africans are feeling encouragingly positive about the next six months” said Philip Panaino, division president, South Africa, MasterCard Worldwide. “The latest consumer confidence score for South Africa shows a remarkable degree of alignment with the South African Reserve Bank statistics showing that increases in South African household credit extension (6.8%), household consumption expenditure on semi-durables (6.3%), money supply (6.4%) and fixed capital formation (5.8%) have been recorded,” Panaino adds. The highest increase in optimism compared to the same period in 2011 came from the Stock Market indicator, which increased by 3.8 points from 62.9 to 66.7. Independent economist Dr. Roelof Botha explains that this is not surprising when viewed against the background of an increase in the JSE’s All share index (Alsi) of more than 7% between February 2011 and February 2012,” says Botha. “The market capitalisation of the JSE, as reflected by the Alsi, has now increased by more than 90% since bottoming out in early 2009, while the average dividend yield on the JSE has increased by more than 50% over the past two years. The Index result for Regular Income yielded the highest overall result at 80.3, even though it increased by just 2.7 points in comparison to the same period in 2011. According to Botha, higher dividends, combined with sustained increases in formal sector salaries, lie at the heart of the improvement in the MasterCard Index for Regular Income. The increase in expectations of Regular Income was mirrored by the increase seen in South Africans’ expectations of their Quality of Life, which also rose by 2.7 points to a score of 70. “This marker is usually the one closest aligned to the overall MasterCard Worldwide Index of Consumer Confidence score for a particular market, as the state of the economy, employment opportunities and regular income all contribute to the ability of consumers to maintain or improve their standard of living,” Panaino points out. When asked if they expected their employment prospects to deteriorate, improve or remain the same in the coming six months, South Africans revealed their confidence in the job market with this indicator rising by 2.1 points to an optimistic result of 67.8. The Economy indicator rose marginally from 63.2 in 2011 to 64.2 in 2012. “There’s a current real GDP growth trajectory of close to 3%, an increase in total real household consumption expenditure and retail sales of 3.7% and 5%, respectively (over the past year) and a return to formal sector job creation, which are likely contributors to the increase in confidence in the economy,” explains Botha. “It’s encouraging that South African consumer sentiment for the next six months is positive. However, the South African consumer confidence level is still off its historical peak of 91.1 points in the second half of 2006, and is below South Africa’s historical average of 71.3 since the survey was first conducted at the beginning of 2004,” says Panaino. When comparing the South African results to the rest of Africa, the only African market to yield a lower result than South Africa was Kenya, with a score of 49, while Morocco showed the highest level of optimism with a score of 94.1, closely followed by Nigeria at 91.4 and Egypt at 90.7. “South Africa is poised to benefit from high economic growth in sub-Saharan Africa, where a spate of large new mining and energy development projects are being implemented. Against this background, the consolidation phase of economic recovery, which has lasted for three years, is bound to progress towards a new growth range of around 4%. Such a prospect is supported by the enhanced level of confidence for the remainder of 2012, evident from the latest MasterCard Consumer Confidence Index,” concludes Botha. The Index is calculated based with zero as the most pessimistic, 100 as most optimistic and 50 as neutral. Five economic factors are measured: Employment, the Economy, Regular Income, Stock Market and Quality of Life. The responses are consumers' thoughts on the six months ahead. Data collection was via Internet surveys and face to face interviews, with the questionnaire translated to the local language wherever appropriate and necessary.